Here's my summary of the key events overnight that affect New Zealand, with news bank bonus incentives are under investigation for all the wrong reasons, this time in Canada. But first, the giant American services sector grew +6% in the December quarter from the same period a year earlier. This is a faster rate than in the third quarter and was led by health care, technical services, and entertainment. In Canada, sales incentives for front-tine bank staff are in the spotlight with embarrassing revelations on how they work in one of the countries largest retail banks. In Madrid, Spain, they are preparing to ban older cars in an effort to reduce local pollution levels. They are to ban petrol cars older than 2000 and diesel cars registered before 2006, all to take effect within seven years. Paris and Berlin already have similar measures in place. Finally the Europeans as acknowledging the huge public policy mistake of encouraging inherently dirty diesel vehicles. In China, they are clamping down on mortgage financing, with top-down directives to reign-in loans for housing 'investment' or speculation. In the UK, Scotland has announced it will go for a second independence vote in early 2019. This is motivated by the the English drive to quit the EU. The London parliament is struggling to get its ducks in line to trigger Article 50 though. Things are getting very messy for Brexit. In Adelaide, the South Australian state government will announce its long-awaited plans of how to deal the failure of the state's electricity system. It will likely involve pumped hydro and the drastic step of renationalising the private electricity grid. In fact, the issues are national with the Grattan Institute declaring their retail electricity industry a 'failure' for consumers. In New York, the UST 10yr yield is rising today and is now at 2.61%. Oil prices are unchanged today at just over US$48 for the US benchmark, while the Brent benchmark is just over US$51 a barrel. US rig counts just keep going up and up and are at their highest since November 2015. They are discovering huge new resources. And Norway is opening up a significant new region for exploration. The gold price is slightly higher today, up +US$3 to US$1,203/oz. And the New Zealand dollar is unchanged at 69.2 USc. On the cross rates the Kiwi dollar is at 91.4 AU¢, and against the euro is at 65 euro cents. The NZ TWI-5 index at 74.8. And yet, Ivanka Trump expects cash strapped US citizens to pay Chinese exporter salaries with one way domestic debt funded, foreign manufactured goods purchases. If government investigative powers are cursory and time limited it will be back to business in the blink of an eye. I'm not surprised that privatisation of the electricity network has failed in SA. Australian corporate culture is terrible for gouging customers and not giving a damn about the long term effects. Maybe it is because of the closure of the Port Augusta coal fired plant and reliance on expensive but unreliable windmills. With the closure of Hazelwood in Victoria there is less back up they can rely on in SA if it blows too hard or not enough wind is available. All of that because of no coordination or planning. It's as if the executives running the power companies are completely clueless about generation and infrastructure. Ah, no. It's political imposition of an RET which hugely advantages the intermittents (wind and solar) while penalising the rest. So the rest - coal at Port Augusta, gas at Pelican Point etc - have simply either folded their tents and departed or placed their generation on low priority, Pure economically rational behaviour. The net effect on pwer (see a live dispatch dashboard here http://www.aemo.com.au/Electricity/National-Electricity-Market-NEM/Data-...) is that non-RET generators are disincentivised to even bid, given the massive RET returns to others: RET generators can easily bid negative and still make money, because the RET, amongst other distortions, guarantees sale for every single electron that they pump. I'd suggest a look at that dashboard then ask yerselves the question: what happens when (if?) VIC switches off Hazelwood? I love how we're bringing that dream to New Zealand. We already have the homeless. Now we just need a recession that we conceal with ZIRP. I think the reasoning is very simple and you have hit it on the head - there will be some serious gaming going on in the NEM. Think Genesis and Huntly a few years ago on a daily basis with SA as one big potential cash cow. The peaking capacity will be there, but there is no way that the SA gens will be wanting to pay the peaking offer rates of the NEM generators. Given they likely have no forward contracts on NEM, they will be very loathe to purchase anything on that market. Not to mention wind capacity being all over the place and no in-State base load to back it up when it don't blow. Installed capacity 1,595 MW - available at event 96 MW. Musk is going to need a few more tax payer subsidies to buy enough batteries to cover that. I've been watching malls since last year. Some interesting documentaries on dying malls. They've always died by they are mostly dead in the west with a few exceptions. Probably better to look at the solar loans in the US that have been securitised. Gareth , this has been a long time coming . I was astonished while travelling on a US roadtrip how whole shopping precincts on the edge of cities had grown these massive malls, often to the detriment of traditional high streets . As an ex-banker involved in Corporate Finance , I wondered how these were funded in the US , because here in NZ and in Aus we have listed property trusts/ companies usually with a lot of debt , but we seldom have MBS or bonds in issue ( Westfield beig the exception with debt paper in issue) so funding this stuff here is not so easy . It could be a perfect storm in the US as the Fed increases interest rates , and the US consumer keeps buying a lot of stuff online, often with the prices of online goods way cheaper than the mall's tenants with high rents , wages and sunk set -up costs which are amortized over the lease but have to be paid every week , fortnight or month . The other issue is that the "anchor' tenants such as Macy's , Wallmart, Costco and Target actually pay very low rents , the rent burden is carried by the "line shops ' and while some of these are specialist chainstores or franchises they are often small businesses with limited capital who pay huge rents and fall over regularly . the trouble with this "bet against the house" view is that it assumes the next crash will or can be followed by some sort of reset and fix. There arent any obvious fix options left. The finance/banking sector has simply grown too big and will reset and this is a global thing I think. Re Australian Power crisis , one is left wondering whether the whole thing has been engineered to get higher prices for power . If so , it could turn around and bite them . The reality is that any product will not be able to sustain its price beyond the level where a competitor(s) can supply . For example when oil went over $100 bbl Canada's oil sands became very viable and US Shale oil became viable . The price dropped dramatically . We know South Australia is sunny , so there will be a move towards solar and wind energy , and the storage costs of energy will come down over time . The Power companies are facing change , and its about time . "when oil went over $100 bbl Canada's oil sands became very viable and US Shale oil became viable "
Rephrased, when US began QE, expensive Oil became viable. 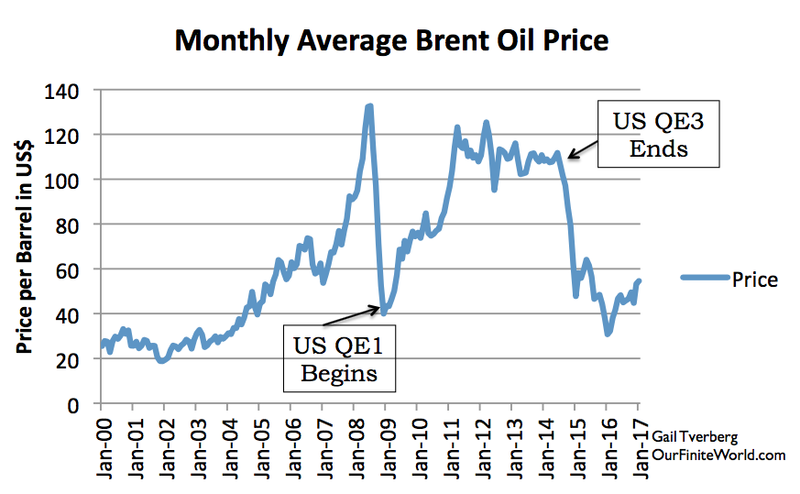 When QE stopped, the Oil price tanked. "In shale fields from Texas to North Dakota, production costs have roughly halved since 2014, when Saudi Arabia signaled an output free-for-all in an attempt to drive higher-cost shale producers out of the market. Rather than killing the U.S. shale industry, the ensuing two-year price war made shale a stronger rival, even in the current low-price environment. In Dunn County, North Dakota, there are around 2,000 square miles where the cost to produce Bakken shale is $15 a barrel and falling, according to Lynn Helms, head of the state's Department of Mineral Resources." So what if they go bust? Let them, I say. The problem isn't with QE (evidently your new big bugbear), it is with OPEC. When all the drillers go bust the economy stops. OPEC is not the problem. Low demand for high priced Oil is. I'd rather read whimsical liberal garbage than anything written by your Messiah 'Gail The Actuary'. "When all the drillers go bust the economy stops." Wrong. The US of A has no restrictions to importation of crude, only restrictions on exportation. So, can they not just supplement that oil with imported oil at a cheaper rate? Sure, net welfare might actually be lower in this case but this is only due to the artificially high rate imposed by OPEC. Hence, in an economic sense, OPEC is the issue here. Low demand is also not the issue. Ironically, it only becomes an issue if you prop up underperforming producers to underpin their unrequired capacity. QE increases demand in the short term, but long term the net effect is neutral. If it isn't, it isn't the fault of economics, but in fact a fault of policy interference. I notice you dont reference anyone. Yes, a pathetic graph that says nothing but exactly what is expected. She also conveniently omits any reasoning behind the other oil price cycles. I don't reference anyone because I use contemporary economic logic. Precedent dictates that common logic does not need to be referenced. oh that is utter rot. Its just a variation on "common sense" except it frequently isnt, its put forward by people unable to form a rational argument. What is irrational about my argument? It isnt an argument based on anything of substance. "common logic does not need to be referenced." that is nothing more than the "common sense" argument, except it frequently isnt. I forgot that basic economic logic was not the norm here. When the drillers go bust there is no one to keep drilling and hence the price will rise over time as the existing fields/wells output declines. When the price spikes like it did in July 2008 we had the GFC and the economy stops. Poor understanding of the logic behind my argument that OPEC is the issue. You dont present an argument you simply state a position. OPEC is really pretty much finished as an organisation at the moment. Every member has committed their revenues as promises to its population and since the price has collapsed cannot deliver except by taking on debt. PS present your argument so we can see it. The price has collapsed because of OPEC. Is that not evident to you? Or, more logically, the Saudis see that their optimal extraction path dictates that they produce now because net economic benefit is going to be maximised this way. I know, a crazy idea. Yip - you make no economic sense. Me, or contemporary resource economics theory? How about you point me at a URL for what you think it means? ignoring data is one sure way to trip over, your funeral. I'm not ignoring it, I'm saying it is perfectly logical. Central bank enters into expansionary phase, demand goes up. Wow, such a revelation. Just where for the last 8 years despite the greatest central bank expansionary phase ever actioned is the increase in demand? All we have seen is the parasitic money normally hidden in the global ponzi finance system leaking out into housing assets, indeed any assets looking for a return. If it wasnt for such mad speculation propping up the system we would be way way worse off, 1930s style. Do you want to look at any country's consumption graph over the past 10/however many years? Do you maybe want to look at the effect of house price inflation on consumer spending in NZ? The world consumes more now than it ever has. You would be crazy to suggest otherwise..
Not sure if Toronto Dominion (TD) Bank is unique. I had a young relative who got a job at a big 4 bank here and it was made quite clear at every review that if her sales performance did not hit their target she would be exited from the banks employment. Can't blame TD Bank alone when every bank is trying to squeeze more revenue out of customers. @Andrewj , I have my strong suspicions about this whole Aussie energy story . Why has it been so sudden? Did the energy regulators not see this coming ? Did the producers not see this coming ? It was left to the free market maybe. Hence no business wanted to invest in peak plants as they would lose shed loads of $s with idel plant. The other thing they do is deny global warming so when surprise, surprise heat waves come well there is a pause in global warming isnt there? cant be getting hotter, no worries then.! Um, it is Something Else. The RET guarantees payment for every electron pushed around by renewables (wind and solar). So RET companies can bid negative because they will still make $ (on every electron). This has led to the exit of synchronous base-load generation (e.g. Port Augusta and if Engie has their way, Hazelwood) and with it the ability to control network frequency (which needs large dollops of inertia to ride through blips) and hence synchronise renewables. They cannot afford to bid negative. Renewables cannot initiate (black-start) a grid - that's why Britain keeps a pumped-hydro scheme in Wales topped up: Dinorwig. That's why there are massive SA interconnects to VIC, where dirty ol' coal keeps large-inertia synchronous reserves spinning. But these will trip off (islanding SA) if overstressed. Quelle surprise, SA suffered a weather-related event which tripped off most of their northern windmills: too many gusts over too short a period and the power electronics said 'Enough already'. Sept 28 Black System in SA resulted, with consequences such as smelters turning into solidified slag and Adelaide dark for many hours. And the interconnects said much the same, when 800+ MW was asked of them within 6 seconds. SA is learning the hard way that poloitical tinkering with core incentive systems has unintended consequences...some call it Karma. I wonder where the union stands on all this, they have a history of being politically active. Your Brexit comments are misleading. You might want to update them. The House of Lords vote was after your message deadline.